I-26 west to Ashley Phosphate Rd. Left at exit ont Ashloep Phosphate. Immediate right on Northside Dr. Short distance down on left. 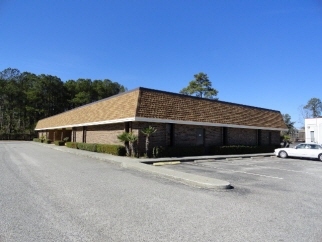 Exterior Features One level commercial building consisting of three suites, situated on 1.78 acre lot with visibility from I-26, near Ashley Phosphate. With two of three suites occupied, this property offers good investment income while exploring best use of parcel for hotel site, office building and other. Lot features drive through access with entrance at front and potential entrance in rear of lot. Perfect location for national branded hotels. Hotels are located all around this property: next to, across the street from, and behind. Plenty of parking spaces. Furniture or equipment does not convey. Additional Features and Amenities Parcel features potential drive-through access - Northside Dr to North Forest Drive. See maps.